The KCC youngster was voted the best player in the 2011 Brookside sponsored East Africa Secondary School Games in Mbarara after propelling his school, St.Marys Kitende, to clinch the regional title. In an exclusive interview with futaa.com, Brookside Dairy Company Marketing Manager Peter Wesonga, revealed that the forward impressed former Gor Coach Anaba Awono in January but failed to sign him as the transfer window had been closed. -Last year in Mbarara, out of all the participating teams from seven countries, he’s the best player in the tournament and he’s currently at KCC. However, the Manager who said their mission is to nurture upcoming talent into superstars, is optimitsic the new coach, Zdravko Logarusic, will sign the player. -As sponsors, we have a policy of offering scholarships to best footballers and link them up to various teams for them to earn a career in football. He’ll be coming to Kenya sometime next week for Logarusic to see him and may be start negotiating, he added. 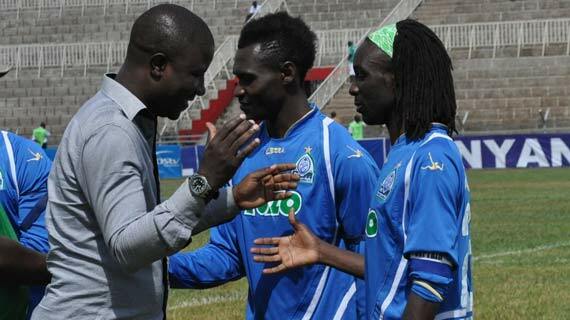 On contacting Gor’s Secretary General George Bwana, he admitted that they are interested in the player. -Mubiru is a success of the Brookside Sponsored Secondary School Games in the region and was here the other time for trials but the technical bench didn’t pick him because they felt he’s still inexperience. -We have been following him and he’s done very well at KCC and we hope to bring him on board, said Bwana. On-form Nairobi City Stars hit-man Dan Sserenkuma could be on his way to Kenyan Premier League giants, Gor Mahia. In an earlier interview with futaa.com, the Ugandan expressed his desire to leave the club. According to Gor Secretary General, George Bwana, Sserenkuma is one of the players in their radar and they’ll be lining-up their bid when the window opens. -The truth of the matter is that the discussions are on. They are at an advanced stage and I think it’s a matter of time. -Though, we do appreciate the fact that the transfer window is not yet open, we are in agreement with the player and his club. -He is one of the players in our radar and once the window opens, we’ll begin serious negotiations with both parties, Bwana told futaa.com. Sserenkuma has so far scored five goals for the Kawangware-based side this season. Midfielder Rama Salim who has been in sensational form for the past month or so has been shockingly dropped from the national team. Others dropped from the team are Victor Ochieng of AFC and Bob Mugalia of Sofapaka. Ochieng has not recovered the form that saw him shine for Chemelil last year and Mugalia has only recently recovered from injury. However the dropping of Rama will come as a surprise to many fans who follow local football. The last time Rama Salim played for the national team was when the U-23 team toured Senegal in February. Rama Salim was one of those who gave an excellent account of himself. That leaves Kevin Ochieng as the only Kogalo player in line to face Malawi in the ANC qualfier next weekend. Lubumbashi based Titus Mulama and Romania based Patrick Osiako will be joining the team. Despite having a nightmarish first half of the season, Gor Mahia leads the league in attendance by a significant margin. The poor performance of the team on the fiels has clearly has not dampened the enthusiasm of Kogalo’s loyal followers. Gor Mahia now accounts for a massive 60% of the total attendance of matches handled by ticket masters. The best attended match this year was the local El Classic which ad 20, 409 fans. Overall the Kenya Premier league recorded a 33 % increase in attendance. However there are still many games being played in empty stadia and the average attendance remains low at 2019 per game. A apaltry number compared to the Egyptian league which at its height has an average attendance of 23,000. Worldwide, the best attended league football league is the Bundesliga at 41,000 fans per game. In the world of sports, the best attended league is is the National Football League (NFL) in the USA whose attendance is over 67,000 fans per game. The increase in attendance of the KPL league is good news. But why is attendance so low. Firstly the stadia are poor. Most were constructed before independence by the colonial government and succesive governments have not seen it fit to upgrade existing stadia or build new ones. The facilities are poor and most do not even have sufficient seating. The second reason is the dearth of community teams. If there were more community teams like Nakuru All Stars, Shabana, Congo United etc, league attendance would be much higher than the present situuation where the league full of corporate teams like Tusker and KCB which do not have a following. Tusker midfielder Crispin Olando is among six key players that Gor Mahia intend to sign in the June transfer window. Club secretary General George Bwana told SuperSport.com that other targeted players include is Rangers FC captain Pascal Ochieng and Thika United striker Kepha Aswani. The club is also finalising talks with Tusker defender Noah Abich and AFC Leopards striker Victor Ochieng and are also said to be interested in Mathare United striker Jesse Were and Jockins Atudo of Tusker. “We shall go for quality players especially experienced ones. Talks are almost complete with our new targets and I can confirm they are all willing to join our club which has a strong fan base. We want to finalise with their respective clubs on the financial aspect before we go public and make a major announcement,” said Bwana. Contacted, Leopards striker Victor Ochieng denied the reports saying he was comfortable at Leopards’ camp. He admitted that Gor officials have been in touch but he is comfortable at Leopards. Rangers Chairman Yobes Ongeri also denied that Ochieng could be headed to K’Ogalo. Victor Ali Abondo has been nicknamed “teargas” because he rash tackle on an AFC leopards player saw him ejected from the Mashemeji derby in 2012. Fans thought the referee had over-reacted and caused mayhem causing the police to react by lobbing tear gas cannisters. Abondo was born in Kisumu and grew up around Nyalenda estate, the same area that produced Kogalo legend, John Okello “Zangi”. He played for Thur Gem secondary school when they were crowned national champions in 2004. Prior to joining Gor Mahia, Abondo played for Palos FC of Kisumu, SoNy Sugar, Bandari and Tusker. He was well known for his ability in dead ball situations and his tactical awareness which has made him a favourite of coach Zdvarko Logarusic. Abondo was released by the club in June of 2013 and immediately signed with Tusker, his former team. The powerfully built Emuge is quite simply an immovable rock at the heart of the Kogalo defence. Aside from having a physique that would intimidate any opposing striker, Emuge is also good on the ball, is good in the air and has abilty to read the game. He was an integral part of the KCC team that won the Ugandan league in 2008. Prior to that, he had also played for Express Red Eagles. The youthful Gathu joined Gor Mahia in mid 2012 from Mount Kenya University. According to the Daily nation, One morning in June last year, Anthony Gathu travelled from his home in Thika to try his luck in achieving his dream of playing for Gor Mahia. He borrowed bus fare to attend trials at the City Stadium. His first day was disappointing and coach Zdravko Logarusic told him he had no place at K’Ogalo. He pleaded for another chance. The following day he showed up and performed splendidly, the Croatian coach promptly signed him. Having only trained with the team for one week and playing one game, he earned the nickname Gaucho in honour of the Brazilian midfield sensation Ronaldinho Gaucho. Gathu has been described by the club’s assistant coach Bobby Ogolla as being fearless, talented and full of youthful exhuberance. The 2013 season was an unfortunate one for Gathu as he was beset by injuries. During the 2013-2014 transfer season, he was released by Gor Mahia to allow him to pursue other opportunities. A player of his calibre was deemed capable of earning a starting position elsewhere in the TPL which would benefit his development. Gor Mahia head Coach Zdravko Logarusic left the country on Friday evening to his native Croatia for a two week rest. Logarusic has been in charge of K’Ogalo for the past eight KPL matches. During his reign, he has managed to help the club rise from 13th place to a current 9th. He has won half the number of matches he has played so far, drew two and lost a similar number. His first match in the league was against Mathare United where the team played to a 1-1 draw. According to the team’s secretary General George Bwana, Logarusic will come back after two weeks and his immediate job will be to finalize the transfers for K’Ogalo.